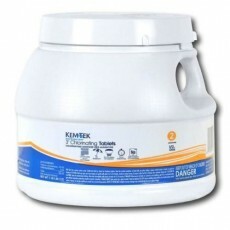 KemTek 3 lb bucket of 3 inch trichlor chlorinating tablets. Each tablet is 8 oz. of 95% powerful available chlorine. Keeps pool water safe and clean by eliminating harmful contaminants.